Just a quick update to tell you that Briella weighs TWENTY pounds!!!!!!!!!!!! 20 times the size at birth!! Hi there, I came across your story when your sweet girl was born. I was pregnant with my baby and we we're due the same month. I followed your story during the first couple of scary months. I remember feeling amazed when Brielle was born that was what my baby looked like, so tiny and safe in my belly. I was one of the hundreds praying for her (and you). I suddenly thought of you the other day so reminded me to check out your blog. 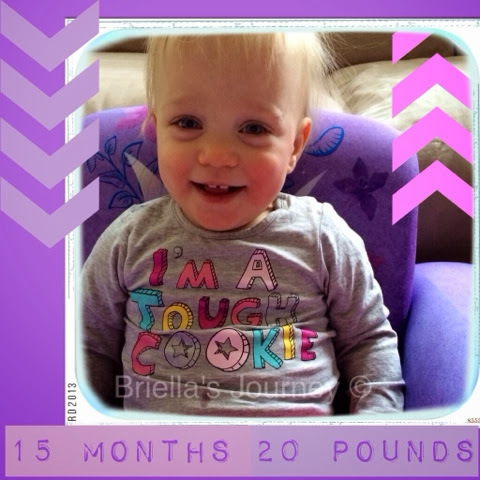 I am so pleased to see Brielle thriving and your family happy and healthy. She is truly a miracle, everyone must be awe of her strength. I'm not a blog follower and have never posted on blog before, I was just so compelled to do so about your story that really resonated with me at the time of her birth. My baby arrived safely on her due date. She is a happy, healthy girl and we feel so blessed as I know you do. I wanted you to know your family has a fan (or two) from Canada! Warm wishes for a happy, healthy life!